In the previous article in geography section, we have discussed in detail about the interior of the earth. We have seen different layers like crust, core, and mantle. The Crust – even though very thin – as being the outer part of the lithosphere, is very significant. 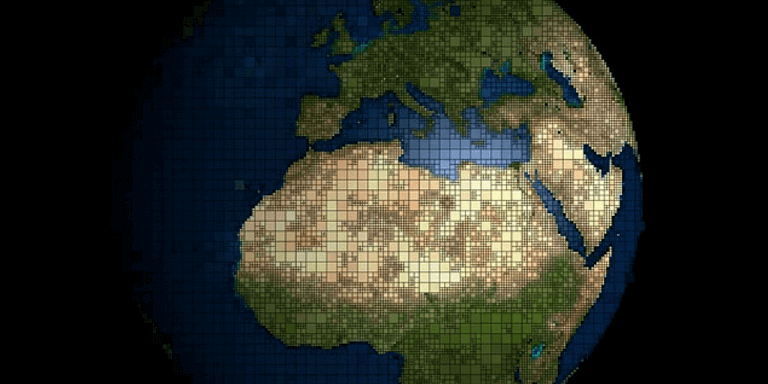 In this article, we focus on how to learn fast the composition of the earth’s crust – i.e, different elements, minerals, and rocks. The earth is composed of various kinds of elements. About 98% of the total crust is made up of eight elements as oxygen, silicon, aluminium, iron, calcium, sodium, potassium, and magnesium. The rest is constituted by elements like titanium, hydrogen, phosphorous, manganese, sulphur, carbon, nickel and others. The elements in the earth’s crust are rarely found exclusive but are usually combined with other elements to make various substances. These substances are recognised as minerals. 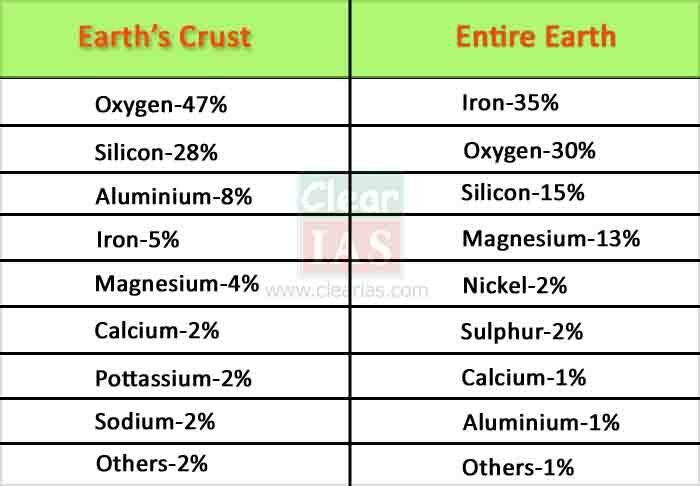 The table below shows the percentage wise share of each element in both the earth’s crust and the whole earth. A mineral is a naturally occurring organic or inorganic substance, having an orderly atomic structure and a definite chemical composition and physical properties. A mineral is composed of two or more elements. But, sometimes single element minerals like sulphur, copper, silver, gold, graphite, etc are also found. The basic source of all minerals is the hot magma in the interior of the earth. When magma cools, crystals of the minerals appear and a systematic series of minerals are formed in sequence to solidify so as to form rocks. The minerals which contain metals are called as metallic minerals (eg: Haematite) and the metallic minerals which are profitably mined are called as the ores. The crust of the earth is made up of more than 2000 minerals, but out of these, only six are the most abundant and contribute the maximum. These six most abundant minerals are feldspar, quartz, pyroxenes, amphiboles, mica and olivine. Silicon and oxygen are major elements of all types of feldspar. Sodium, potassium, calcium, aluminium, etc are found in specific feldspar varieties. Half of the earth’s crust is composed of feldspar (plagioclase (39%) and alkali feldspar (12%)). 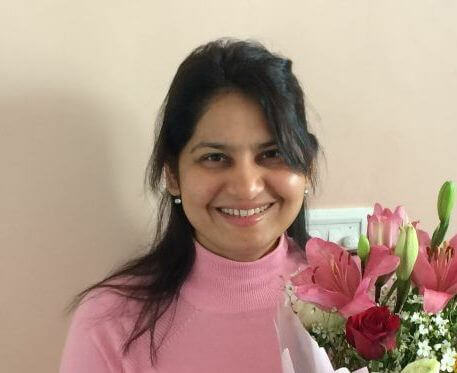 It has light cream to salmon pink colour. It is commonly used in ceramics and glass making. It is one of the most important components of sand and granite. It consists of silica and it is a hard mineral virtually insoluble in water. It is usually white or colourless. They are used in the manufacturing of radio, radar, etc. The common elements in pyroxene are Calcium, aluminium, magnesium, iron and silicon. About 10% of the earth’s crust is made up of pyroxene. It is commonly found in meteorites. Its colour is usually green or black. Aluminium, calcium, silicon, iron and magnesium are the major elements of amphiboles. They form 7% of the earth’s crust. It is green or black in colour and is used in asbestos industries commonly. Hornblende is another form of amphiboles. It is made up of elements like potassium, aluminium, magnesium, iron, silicon, etc. It forms 4% of the earth’s crust. 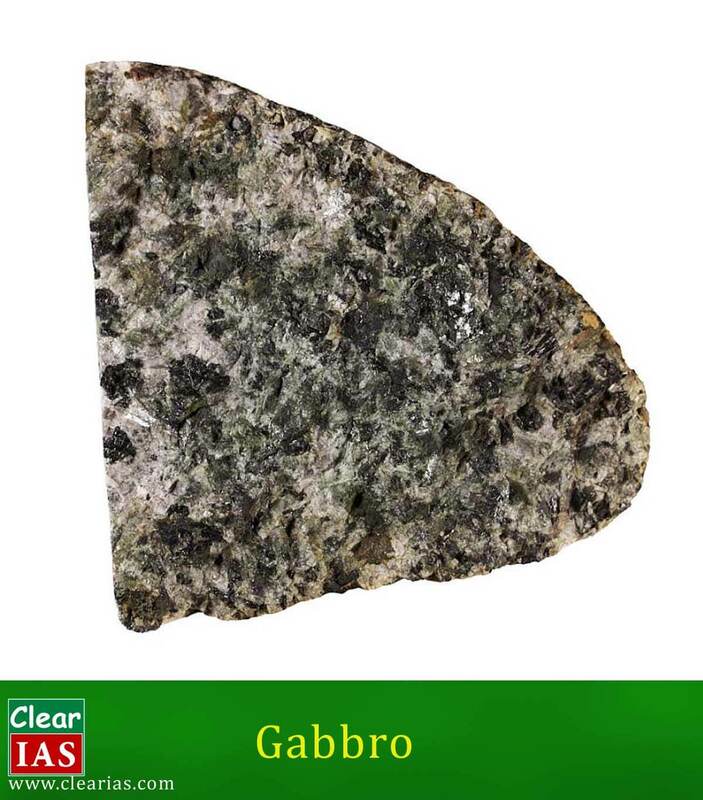 It is commonly found in igneous and metamorphic rocks. Mica is widely used in electronic instruments. Magnesium, iron and silica are the major elements of olivine. It is commonly found in basaltic rocks with a greenish colour. Olivine is used commonly in jewellery. A rock is nothing but a composition of minerals. They are aggregates or a physical mixture of one or more minerals. Rocks may be hard or soft and in varied colours. Feldspar and quartz are the most common minerals found in all type of rocks. The science dealing with the study of rocks is called as Petrology. As we said above, rocks differ in their properties, the size of particles and mode of formation. 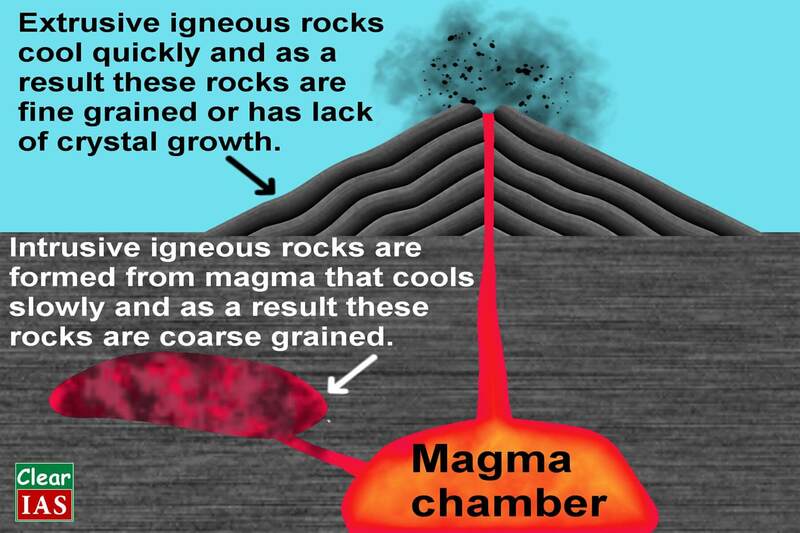 Igneous rocks are formed by the cooling of highly heated molten fluid material called as Magma. Asthenosphere, which is just below the upper mantle, a region beneath Lithosphere is the main source of magma. They might be formed directly by cooling of magma from the interior of the earth itself or by cooling of lava from the surface of the earth. As they comprise the earth’s first crust and all other rocks are derived from them, they are also called as the parents of all rocks or the Primary Rocks. They are the most abundant rocks in the earth’s crust. On the basis of their mode of occurrence, igneous rocks can be classified as Intrusive and Extrusive Igneous Rocks. They are formed when magma solidifies below the earth’s surface. The rate of cooling below the earth’s surface is very slow which gives rise to the formation of large crystals in the rocks. That is, the mineral grains of intrusive igneous rocks are very large. Deep-seated intrusive igneous rocks are called as Plutonic rocks and shallow depth intrusive igneous rocks are called as Hypabyssal Rocks. They are formed by the cooling of the lava on the earth’s surface. As lava cools very rapidly on the surface, the mineral crystals forming extrusive igneous rocks are very fine. These rocks are also called as Volcanic Rocks. On the basis of chemical properties, igneous rocks can be classified as Acid and Basic Igneous rocks. They are formed as a result of solidification of acidic (high viscous) or basic lava (low viscous). Acidic igneous rocks are composed of 65% or more of silica. They are coloured, hard and very strong (Eg: Granite). Basic igneous rocks contain less than 55% of silica and have more iron and magnesium. They are dark in colour, weak enough for weathering (Eg: Basalt, Gabbro). These rocks are formed by successive deposition of sediments. These sediments may be the debris eroded from any previous existing rock which may be igneous, metamorphic or old sedimentary rocks. 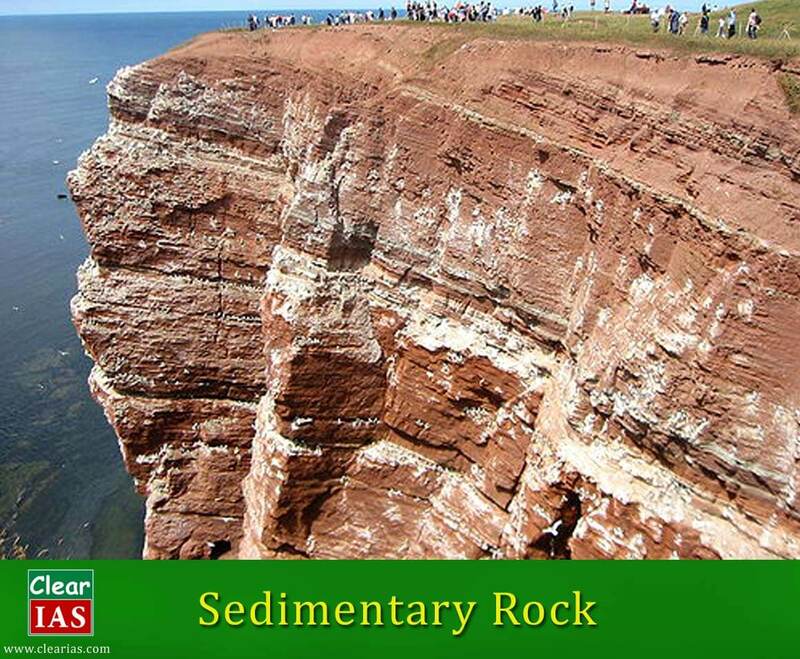 The process of successive deposition and formation of sedimentary rocks is called as Lithification. Due to successive depositions, they have a layered or stratified structure and hence are also called as Stratified Rocks. They are formed by the consolidation of sediments under excessive pressure and cementation. Eg: Conglomerate, Breccia, Sandstone, Shale, etc. The consolidation of organic matters derived from plants and animals form this type of rocks. Eg: Coal, limestone, chalk, chert, etc. They are formed by various chemical reactions. Eg: Gypsum, rock salt, limestone, etc. 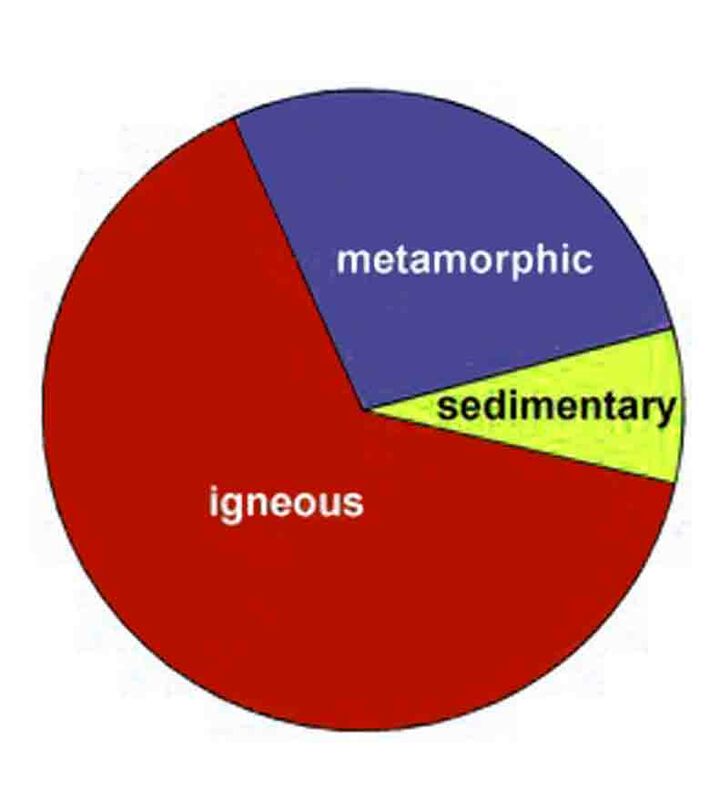 The word metamorphic means ‘change of form’. Hence, these rocks form under the action of temperature, pressure and volume changes on original rocks. 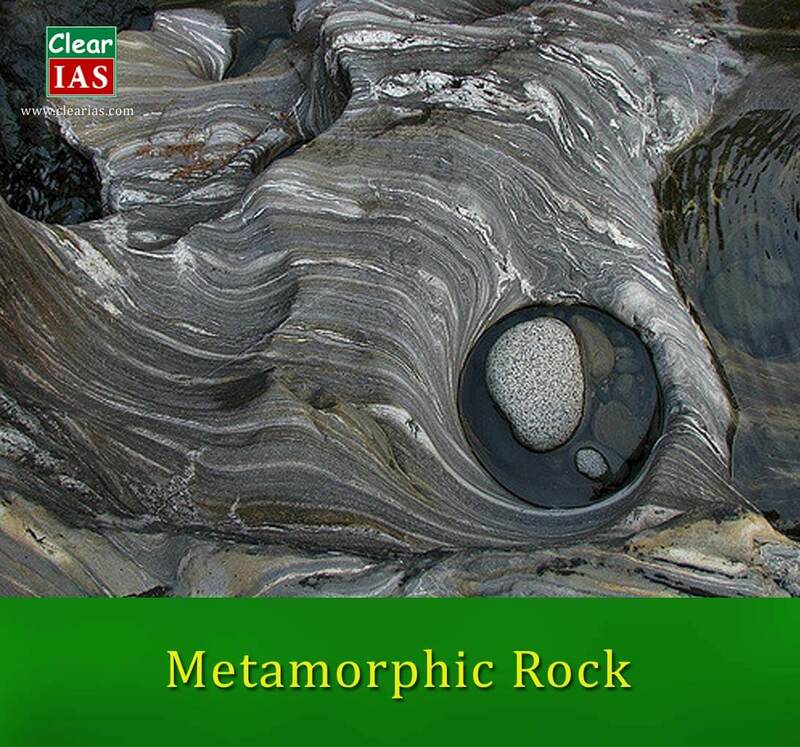 Metamorphic rocks are formed under the influence of heat or pressure on original rocks which cause to change their colour, hardness, structure and composition. The process of recrystallization and reorganisation of materials within the original rock is called as metamorphism. When the metamorphism happens without any appreciable chemical change, it is called as Dynamic Metamorphism. If metamorphism happened due to the influence of heat, it is called as Thermal Metamorphism. It has two types: Contact Metamorphism and Regional Metamorphism. When the reorganisation occurs due to direct contact with the hot magma, it is called as Contact Metamorphism. If the rocks undergo reorganisation due to tremendous heat/ pressure formed as a result of tectonic shearing, it is called as Regional Metamorphism. Metamorphic Rocks can be classified into Foliated (Slate, Schist, Gneiss) and Non-Foliated (Quartzite, Marble) Metamorphic Rocks on the basis of the presence or absence of bands of mineral grains. Rocks do not remain in their original form for a long time but may undergo transformations. 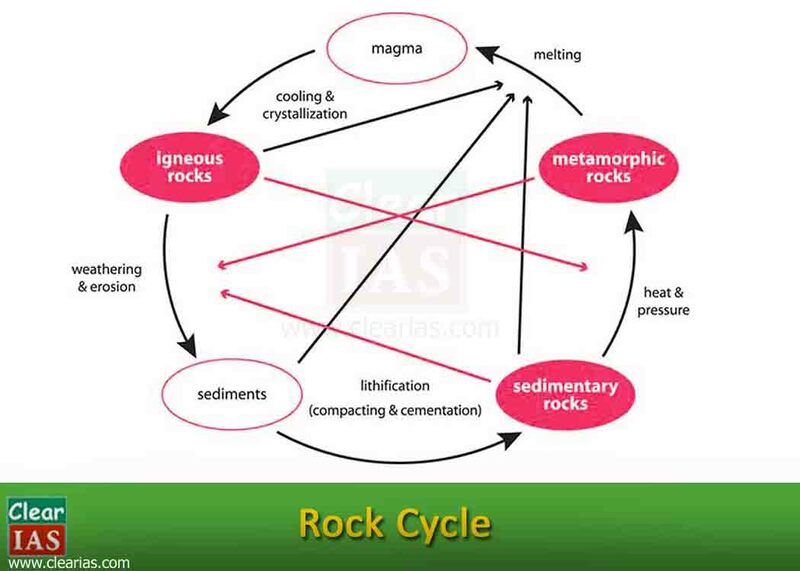 The rock cycle is a continuous process through which old rocks are transformed into new ones as shown in the diagram below. “Crust” describes the outermost shell earth. Our planet’s thin, 40-kilometer deep crust—just 1% of Earth’s mass—contains all known life in the universe. Oceanic crust is mostly composed of different types of basalts. Geologists often refer to the rocks of the oceanic crust as “sima.” Sima stands for silicate and magnesium, the most abundant minerals in oceanic crust. 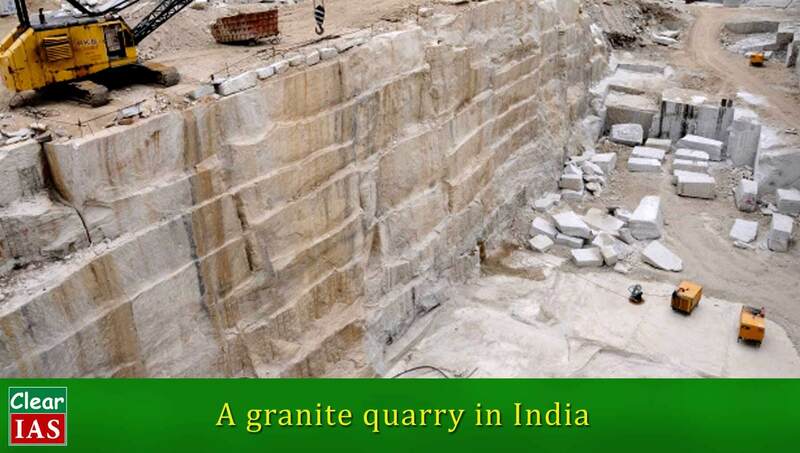 Continental crust is mostly composed of different types of granites. Geologists often refer to the rocks of the continental crust as “sial.” Sial stands for silicate and aluminum, the most abundant minerals in the continental crust. Sial can be much thicker than sima (as thick as 70 kilometers kilometers), but also slightly less dense (about 2.7 grams per cubic centimeter). Are Acidic Igneous Rocks light coloured ? The Article mentions them as just coloured! Yes, they are light colored. 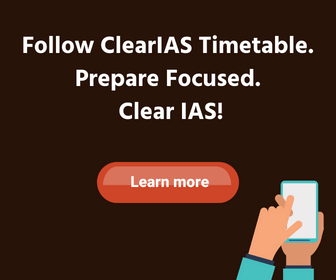 is this article is enough for nda (geography)?